This shot was taken at the very back of the visitor centre, I know I go there a lot these days but I will explain all of that in a minute. I am on a mission at the moment to try and stay away from photographing trees and I have a lovely new project on the way to share with you. So, I’m in the park on a very lovely cold but sunny winter’s morning, one of the rare occasions when I also have the car in tow. With that luxury I can also bring both film and digital cameras with me. It’s such a beautiful morning that I decide to head to the coffee shop in the visitor centre to grab a takeaway coffee and then head about my business. By the time I have gone in to the coffee shop and waited literally two minutes for my coffee the sun has disappeared and its just started to rain. It’s not real rain, as we like to say in Ireland, it’s just kind of blowing around. It’s not really a wet kind of rain, just more of an annoyance if that makes sense. Still, it is raining so no chance of taking either camera out of the bag. I decide to give up on the thoughts of wasting lots of film on a day like today so I throw the digital yoke on my back, put up my hood and head out the back gates of the visitor centre. As soon as I walk out this scene grabs my attention and I start thinking about coming back some day when the weather is better to get a shot of these trees. As I stand and stare down the line of trees, I like to stand and stare, it’s much easier than walking all the time, the sun slowly starts to peak out from between the clouds. By the time I set up the camera and take the shot the sun disappears again, not to be seen for the rest of the day. They do a nice coffee in the visitor centre by the way, just as well, I had to buy another one as the first one had gone cold by the time I took the photo. Really pleasant staff and they do great food at lunchtime. 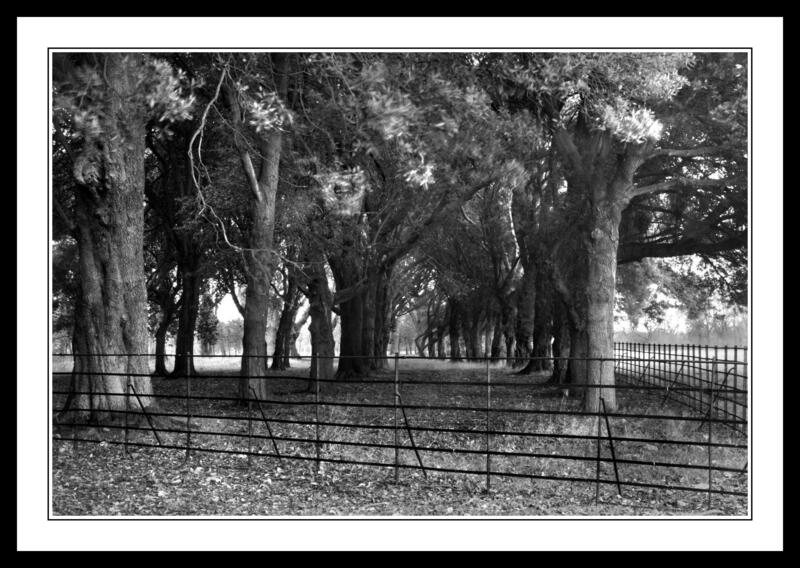 This entry was posted in Black and White Photography, Irish Landscapes, Phoenix Park, Photography and tagged Black and White, Black and White Photography, Phoenix Park, Photography, Visitor Centre. Bookmark the permalink. Very nice. Worth a good stare! Thanks Val, glad you liked it. One of my recent favourites I must admit.